This photo was taken at the Gliderport in La Jolla, California – one of the most peaceful places I’ve ever experienced. Please take a look at other interpretations of the Challenge here. Beautiful and mesmerizing photo. The glider adds a nice touch and element to the already lovely image. Thank you for your kind words. I didn’t have to work very hard for this one – it was a lovely setting. Thanks, James. It was serendipity, really – a lovely evening on the southern California coast. I wish all images were as easy to capture! Thanks for the enthusiastic encouragement! A really beautiful image. 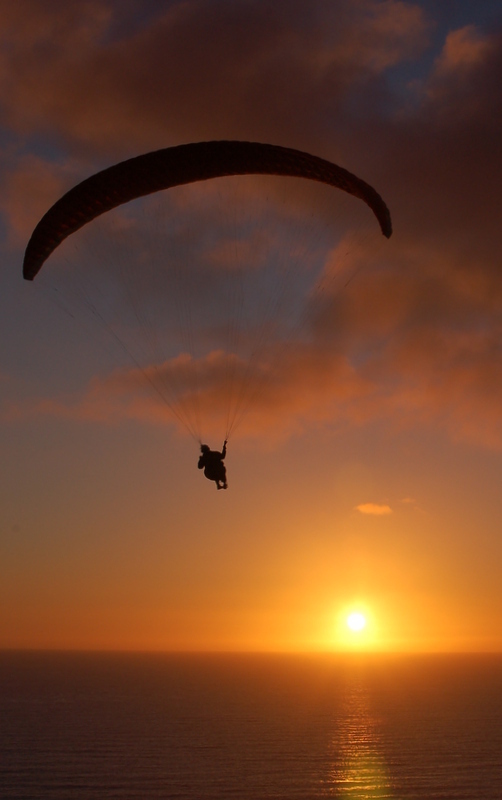 To have a para-glider in front of that sunset is simply stunning. Very nice, Stephanie! Thank you! It was a beautiful evening in a beautiful setting. Hi, Mike! It’s so good to hear from you. I’m doing well and looking forward to the upcoming holiday season. How about you?